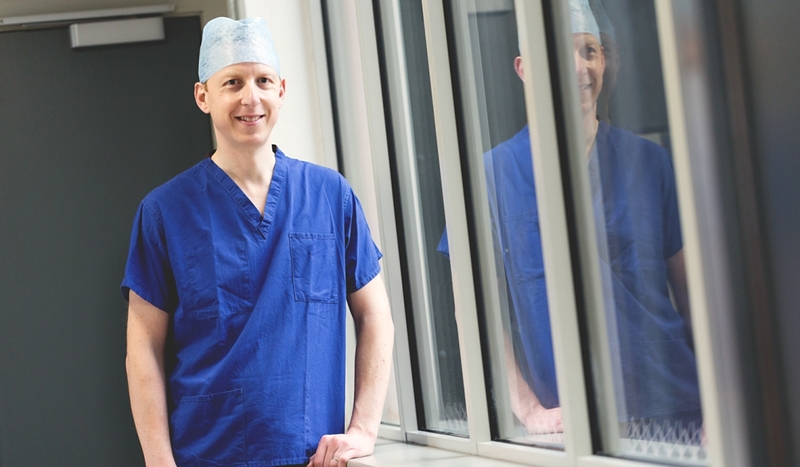 As a specialist in abdominal wall and groin hernia surgery, Mr Clarke follows current national and international guidelines (see resources) using both keyhole (laparoscopic) and open techniques. A hernia is a hole in the muscles of the abdominal wall, through which the contents of the abdomen (such as fat and/or the intestines) can protrude. They can be present at birth or occur later in life. They often occur at points of natural weakness in the abdominal wall as a result of factors such as smoking, obesity, repeated heavy lifting or coughing. They can affect one or both sides. What types of hernia are there? When the hernia protrudes, commonly on standing or coughing, it may cause an aching or painful sensation. This often resolves on lying down so that the hernia can drop back inside or by pushing the hernia away. Sometimes the hernia will not drop back inside (irreducible). In severe cases this may cause ‘strangulation’ of the bowel or fat resulting in the need for emergency surgery. Alarm symptoms for this are redness or tenderness over the hernia, with or without vomiting. A hernia will not normally heal on its own and may become bigger over time. In asymptomatic or minimally symptomatic male inguinal hernia patients, or in those with any type of hernia who are not fit for surgery or who wish to avoid surgery, a ‘watch and wait’ policy may be advised. Which operation is right for me? This will be discussed in detail in the outpatient clinic with Mr Clarke. There are several options available and the right one will depend on the type of hernia, patients’ symptoms and patient choice. Open hernia repair can be carried out under local anaesthetic for simple groin, paraumbilical or incisional herniae, particularly if the patient is elderly, has a number of other medical conditions or if the patient chooses. This means that you are awake, but the area is numbed using an injection of local anaesthetic so that you don’t feel any pain. Advantages may include safety, earlier discharge and less risk of post-operative urinary problems than with general anaesthetic. Laparoscopic surgery is performed under general anaesthetic. It is thought to have advantages in reducing immediate and long-term post-operative pain, with quicker recovery. It is also recommended as treatment of choice for patients with bilateral groin herniae (i.e. both sides), recurrent herniae (has come back after previous repair), female groin herniae and those at risk of chronic pain (younger patients, those where pain is main symptom or those with chronic pain issues normally). In some cases the keyhole approach cannot be used due to previous major abdominal surgery or the size of the hernia which will be discussed with you in the clinic. Once a decision is made to go ahead with surgery, you will need to attend the pre-assessment clinic, at which a number of routine checks and blood tests will be performed. The choice of procedure will have been discussed in clinic. This will be performed under general or local anaesthetic. A single cut (incision) is made over the hernia (around 5-8cm long). The contents of the hernia are pushed away (reduced) and a piece of mesh is secured with stitching (suturing) at the weakened area. The skin is injected with local anaeshetic for post-operative pain relief and the skin closed with a dissolvable stitch. General anaesthetic is used, so you will be asleep during the operation. 3 small cuts (incisions) measuring <1cm are made in the lower abdomen beneath the belly button. A thin camera (laparoscope) is inserted through one of these incisions. Instruments are then passed through the muscle wall and a space is created between the muscle wall and the peritoneal cavity (lining covering your organs). The hernia contents are pushed away (reduced) and a piece of mesh material is placed to cover the weakened area. The incisions are injected with local anaesthetic for post-operative pain relief and then closed using dissolvable stitches. This will be performed under general or local anaesthetic. A single cut (incision) is made over the hernia, the hernia contents are pushed away (reduced) and the weakened area is closed using a stitch (suture) +/- mesh material. The incision is injected with local anaesthetic for post-operative pain relief and closed using a dissolvable stitch. This will be performed under general anaesthetic. 3 small cuts (incjsions) <1cm are made on one side of the abdomen. A thin camera (laparoscope) is inserted through one of these incisions into the peritoneal cavity (lining containing your organs). Instruments are passed through the muscle wall, the contents of the hernia are pushed away (reduced) and a mesh is secured at the weakened area using small staples or glue. The incisions are injected with local anaesthetic for post-operative pain relief and closed with dissolvable stitches. This will be performed under general or local anaesthetic. A single cut (incision) is made over the old scar, the hernia contents are pushed away (reduced) and the weakened area is closed using stitches (sutures) and mesh material. The incision is injected with local anaesthetic for post-operative pain relief and closed using a dissolvable stitch. This will be performed under general anaesthetic. 3-5 small cuts (incjsions) <1cm are made at the side(s) of the abdomen away from the old scar. A thin camera (laparoscope) is inserted through one of these incisions into the peritoneal cavity (lining containing your organs). Instruments are passed through the muscle wall, the contents of the hernia are pushed away (reduced) and a mesh is secured at the weakened area using small staples or glue. The incisions are injected with local anaesthetic for post-operative pain relief and closed with dissolvable stitches. These less common types of hernia may be performed with laparoscopic (keyhole) or open surgery depending on their size and site. The exact details of surgery would be discussed with you in the outpatient clinic. Most patients undergoing simple groin, paraumbilical and incisional hernia repair are discharged on the same day as the operation (daycase). Patients are normally ready to be discharged around 3-6 hours following surgery. You will be discharged with painkillers and written post-operative instructions. All stitches are dissolvable. The waterproof dressings are suitable for the shower and can be removed after 7 days. Full recovery takes 1-2 weeks after open and laparoscopic (keyhole) groin or paraumbilical hernia surgery. Recovery after laparoscopic (keyhole) incisional hernia surgery is similar but may take 4-6 weeks after open incisional hernia surgery. Damage to surrounding structures – the blood supply to the testicle can be injured in rare circumstances and in keyhole procedures there is a very small risk of damage to other abdominal structures. Deep vein thrombosis / pulmonary embolism – a blood clot can form in the legs and pass to the lungs. The risk of this is very low and preventive meausures such as compression stockings and/or blood thinning injections (heparin) are routinely used. Long term (chronic) pain – this can affect around 5% (1 in 20) of patients and the cause of this is largely unknown but may relate to post-operative scarring around the nerves or intraoperative nerve damage.